AdJab points us to an activist site, called Baby Politico, where psycho, politico-parents can buy their babies clothing emblazoned with cause-related messages. Not that the messages are bad but the idea of parents using their helplessly innocent babies to promote their own causes is truly less than respectful. "... using their helplessly innocent babies..."
Exactly who do you think is dressing all the other babies in the world? Every 'helplessly innocent' child is already being 'less than respectful[ly]' dressed (or not dressed) according to the values of some adult somewhere. This is no worse than 'Baby Gap;' it just promotes a different cause. In fact, this may be better than Baby Gap, as the parents are less likely to be oblivious to the otherwise-subtle way they impose a value system onto the 'poor, unsuspecting' child via fashion. Last I knew, it was a parent's JOB to impress a value system upon his/her child. Perhaps I'm speaking too quickly; I am relatively new to your site, so no doubt I missed your indignant comments on psycho parents who would force their baby to wear Gap logos, etc. If so, I stand corrected and apologize for the misunderstanding! Ah, yes, early indoctrination. A variation on the old theme used by Hitler, Stalin and Mao. Get 'em while they're young. Isn't there some old internet joke about how all threads eventually lead to a Hitler reference? Didn't take this one long! 1. The purchase and display of this clothing would seem to be substantially less compulsory than, say, membership in Hitler Youth. I saw nothing on the site about mandatory rallies to which the children were expected to wear this clothing, though I must admit I didn't search too long. 2. 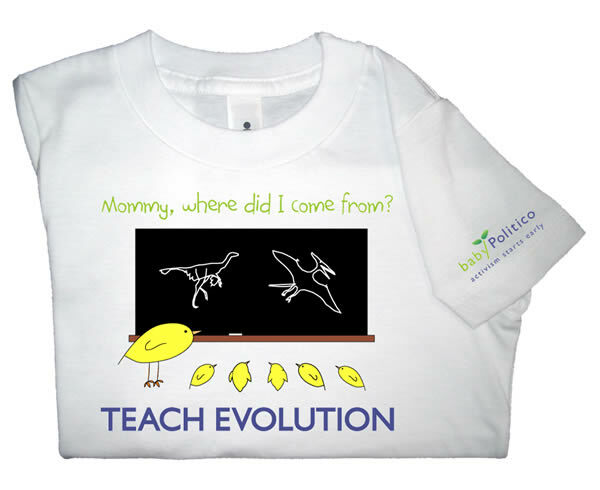 These items are available in sizes from 6 months to 4 Toddler; as most kids can barely read at 4, I'd say that the shirts themselves are not going to have much opportunity to indoctrinate the children. OTOH, any parent who cares enough about one of these issues to fork over money for the shirt is probably already living out the values they wish to pass along, anyway; and kids don't need to read to get that message.